CHICAGO — (BUSINESS WIRE) — July 23, 2015 — SIGGRAPH 2015, the annual interdisciplinary education experience and conference on the latest computer graphics and interactive techniques, will debut a new program this August. The 2015 VR Village will feature real-time immersion in the latest virtual and augmented realities, including Nomadic Virtual Reality (VR), Tabletop Augmented Reality (AR), Full-Dome Cinema, and live performances and demonstrations in a 360-degree immersion dome. The 42nd annual SIGGRAPH Conference will take place 9-13 August 2015 at the Los Angeles Convention Center in Los Angeles, CA. The VR Village at SIGGRAPH allows attendees to explore the fascinating potential of VR, AR and Immersive Environments as a means for telling stories, engaging audiences, and powering real-world applications in health, education, design, and gaming. The curated programming offers a wide range of content from major studios and game developers to non-profit institutions, including research labs and planetariums. The VR Village is a virtual screening room for cutting-edge VR, AR and Immersive Media programming. Nomadic VR Arena: A walk-about space that allows participants to freely explore immersive virtual environments with untethered headsets. 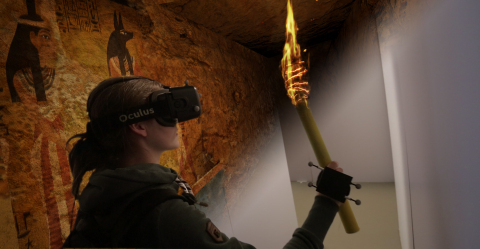 Real Virtuality: Immersive Explorers – Multiple users explore the recreated interior of a pharaoh’s tomb while interacting with 3D objects and other users. C.A.P.E. (Computer Assisted Personal Environment) – C.A.P.E. is a configuration developed by CREW, EDM/UHasselt and Dreamspace where people can move and walk the “immersant” experiences of the virtual world from your own body. Holojam – Share a virtual space and see each other as stylized avatars; draw shapes in the air with a magic wand and contribute to 3D sculptural artwork. Head-Mounted Display Stations: Attendees can experience the latest in VR and AR programming in sit-down and stand-up stations. Neuro – A VR journey through the brain of world-renown musician Reuben Wu. LoVR – A story of love told through neural activity captured over four seconds; Experience two lovers when they see each other for the first time. Immersion Dome: The dome is a 360-degree screening room for the world’s best visualization and cinema storytelling. Dynamic Earth: Coronal Mass Ejection and Ocean/Wind Circulation – Follow energy from the sun towards the earth; where atmosphere and oceans are explored. Immersive Visualizations from the California Academy of Sciences – Experience the 1906 San Francisco earthquake; explore the earth’s ecosystems over the millennia.